Uwintiji Clementine in "Sweet Dreams." Photograph by Lex Fletcher. Directed by Lisa Fruchtman, Rob Fruchtman. 2013. Rwanda | USA. 89 mins. Kinyarwanda with English subtitles. This New York Times Critics’ Pick tells the story of a remarkable group of Rwandan women who defy the devastation of the genocide to form the country’s first all-female drumming troupe and open the country’s first ice cream shop. 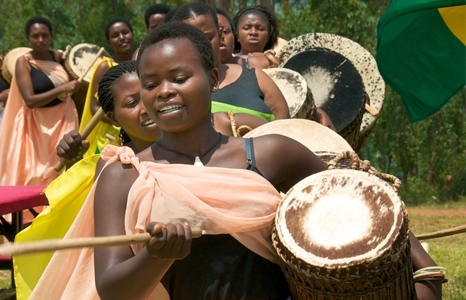 The drumming troupe Ingoma Nshy offers a place of support, healing and reconciliation for its members—who come from both sides of the 1994 Rwandan genocide. When the group decides to partner with two American entrepreneurs, Jennie Dundas and Alexis Miesen of Brooklyn’s Blue Marble Ice Cream, and open Rwanda’s first ever ice cream shop, these women embark on a journey of independence, peace and possibility. Sweet Dreams interweaves heart-wrenching stories with joyous, powerful music to present a moving portrait of a country in transition. Mark Women's History Month with this powerful tribute to these powerful women. Special guests at April 1 7:30pm screening: West African dance and drum troupe Sewa Faré performs before the film.